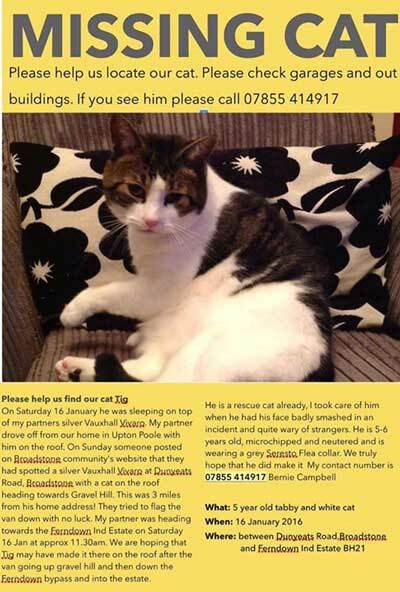 A woman is desperate to be reunited with her cat after it was accidentally driven away from home on the roof of a van. Bernie Campbell described the “horrible moment” she realised what had happened to her pet, Tig, after he went missing two weeks ago. 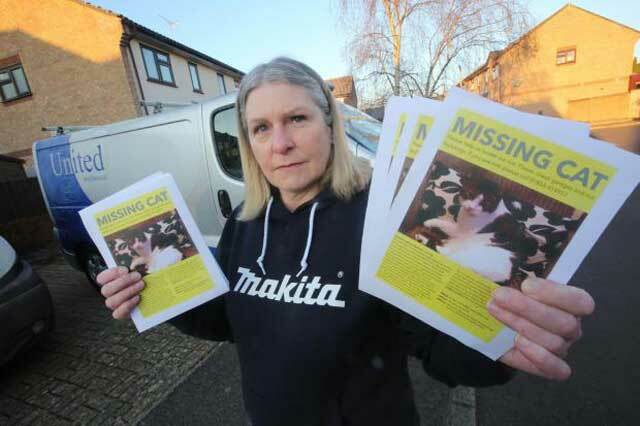 When a member of the public posted on social media that they had spotted a cat on the roof of a silver Vauxhall Vivaro passing though Broadstone in Dorset, three miles away from Bernie’s home in Upton, her fears were confirmed. Her partner, Jamie Tilsed, had been driving to Ferndown Industrial Estate but did not realise Tig was asleep on the roof when he set off. The couple are hoping Tig would have survived the journey and are doing everything they can to relocate him. I’m heartbroken right now, and I’ve had very little sleep. I want my boy back,” Bernie said. “We checked the van and you can see where he was as he has ripped through the paint down to the metal and there’s fur stuck in the double roof rack system where he must have been pinned into the corner. “People were trying to flag down the van, apparently, but with no luck.” The couple have had Tig since August 2013. He was abandoned by his previous owners and Bernie took him in after finding him badly injured one day. “He had a horrible start in life. I took care of him when he had his face badly smashed in an incident where he ended up in the back of a dustbin lorry. His tongue was split from top to bottom, and the vet said at the time he would have to be put down if they were unable to save the tongue. At least its last ride was fun! Hey Arbroath, could you moderate the previous comment please, as in, take it off. I feel for the people who have lost their cat.